The little boy looked out his bedroom window as the snow fell. It was beginning to cover the rocks around the edge of the pond that he so dearly loved to look at. He had been sick a long time and looking at the pond, with its’ waterfall and fish, was one of the few pleasures he had in his young life. Snow was unusual in this part of the country and even though he enjoyed seeing the flakes falling, he was concerned about the fish in the pond. Christmas was only days away and snow would seem to fit the season. This fact was no consolation as the boy strained to see his beloved fish through the snowflakes. When his mother entered the room, her son anxiously asked her if the fish in the pond were going to be all right. Sitting down on the bed, she assured him that as long as the water flowed down the waterfall and into the pond, the fish would be fine. This trusted word and presence of his mother were so comforting that he fell asleep as the two of them watched the snow fall on the pond. When he awoke some time later, he quickly looked out his window to see the pond. It was dark now and what he saw made him gasp in amazement and joy. 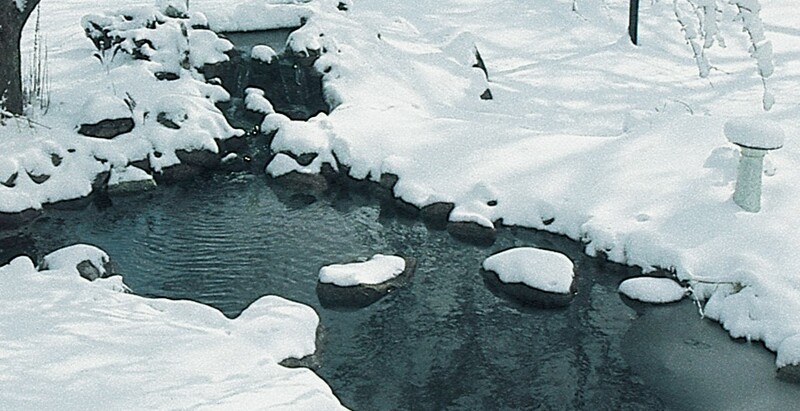 The snow had stopped falling but now covered the ground and the rocks around the pond. The full December moon was glistening off the white blanket that surrounded the boys’ beautiful vision. The fish were swimming slowly in the crystal clear water, as if suspended in air, and their brilliant colors shown in the moonlight like jewels. The water danced over the waterfall and fell into the pond sending diamond splashes across the surface. This was the most wonderful thing he had ever seen! In the morning, when his mother came to his room, the boy was sitting up in bed as though still gazing out at the pond. But he was not to ever look out at his beloved pond again. Normal weather returned that day and the whole town was talking about the unusual snow that had fallen. But the little boys’ mother knew why this had happened, just in time, for her son’s Christmas Pond.